Located in Fargo, ND, and operating within commercial real estate sales and leasing since 1977, Konrad Olson Real Estate, Inc. specializes in commercial, industrial, retail, and office real estate property. 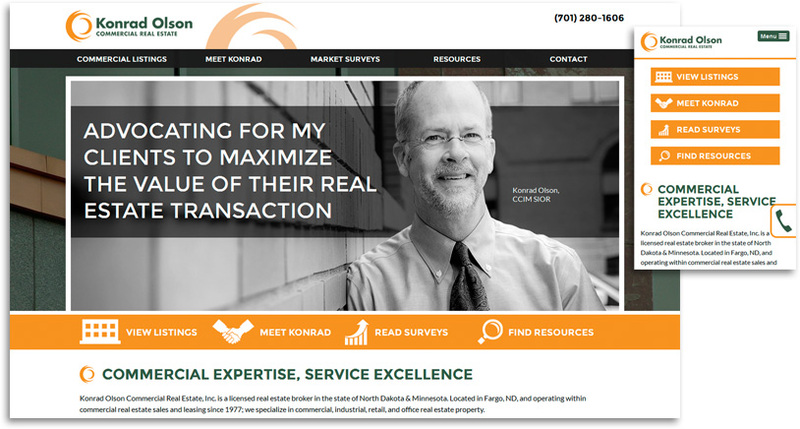 Konrad was in need of a website that reflected the years of experience he has accumulated, and where customers would be able to search his commercial listings and make contacting him an easy process. We collaborated with Konrad Olson to develop a design that incorporated his established branding and integrated commercial real estate listing widgets. Konrad was able to provide professional photography of himself and the notable properties he has sold. We were able to integrate these into the design to showcase examples of his dealings and to promote his experience.